It is said that a picture is worth a thousand words. 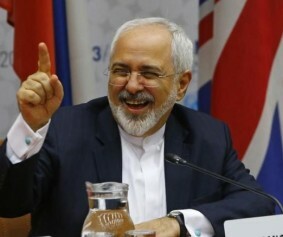 If that is so, the pictures of an utterly jubilant Mohammed Zarif, in Vienna, on July 14, says it all. 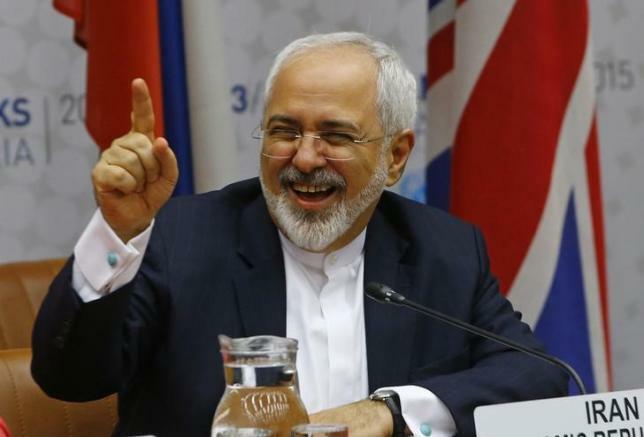 In the Six Power-Iran talks the side with all the aces lost and the side whose hand consisted entirely of jokers, won. It only remains, now, for President Obama’s “\victory” declaration. He needn’t bother his speech writers. He can use Prime Minister Neville Chamberlain’s words on returning to London from Munich in 1938 or if he prefers, President Clinton’s television appearance after the “historic” agreement made by the feckless West with North Korea in 1994. Supreme Leader Khamenei and President Rouhani, presumably hoarse from joining the mobs screaming “Death to America” and “Death to Israel” on the day the final draft was apparently agreed-upon can now turn to the burning questions of how to use the tens of billions of unfrozen dollars and whom to favor with the business resulting from the cancellation of sanctions: Russia? China? Germany? Why not all three? The deal will be analyzed within an inch of its life, but here we would like to emphasize two aspects of a nuclear Iran that have not been given due attention. The first is that the deal, if it goes into effect, will result in one of the most volatile and dangerous regions of the world becoming home to at least four and possibly five, nuclear powers: Israel, Iran, Saudi Arabia, Turkey and perhaps Egypt. The possibility of international nuclear conflict will have increased exponentially. The second overlooked danger is the possibility of Iran achieving the ability to miniaturize nuclear weapons. This is not easy and takes time–North Korea, which renounced nuclear weapons in 1994 as we have seen, just recently announced that it had achieved that ability. As soon as the announcement was made, it should have been bombed into oblivion, but forget it. North Korea may well sell miniaturized devices to terrorist groups, but Iran would simply give them to favored proxies. So it’s all up to the U.S. Congress to vote the agreement down. Or is it? Reports have surfaced that the U.S administration will support an immediate vote in the U.N. Security Council to revoke all previous Iranian sanction resolutions, effectively pre-empting Congress on the issue. This would not, however, result in the release of the frozen Iranian funds. The Administration might simply go ahead and do that, as it did with some of the funds when the negotiations started, way back at the end of 2013. Either action would be grounds for impeachment, but forget that too. In any case, it is not clear if opponents of the deal would be able to achieve a veto-proof majority in both houses of Congress to override. We’ll know within sixty days of the signing. However, it’s not clear that it really matters, as noted above. The West could use a lot more backbone and fewer “historic” agreements. Selah!